Our story begins with Jack DelZotto, who came to Canada from northern Italy in 1927. After a few winters in northern Ontario, Jack DelZotto moved to Toronto and began building beautifully crafted homes for single families. By the 1950’s, DelZotto Enterprises had been formed, a real estate development firm headed by Jack’s three sons (Angelo, Elvio, and Leo) and focused on the development of subdivisions and small apartment buildings. The venture, like Jack’s previous undertakings, flourished and in 1961, the company built its first twin tower apartment complex, featuring 520 suites and a recreational centre including a swimming pool, fountains and fully landscaped grounds. This complex was the forerunner of the luxury condominium lifestyle, which is the hallmark of the Tridel building philosophy. In 1969, the Tridel Group completed its first condominium. Just following, Del Property Management was formed in order to ensure that the Tridel lifestyle was maintained and that the building operations were professionally managed. Del Property Management is now the leader in condominium property management. By the mid-70s, the brand Tridel was starting to establish itself in the condominium marketplace. Tridel has built 80,000 condominiums since it was formed. Throughout the next two decades, the group expanded to include more specialized companies to respond to market needs including Del Management Solutions Inc. (focused on residential and commercial property management), Del Condominium Rentals Inc., Del Realty Brokerage Inc., DelSuites “specializing in executive accommodations” and Delmanor, providing exceptional retirement living. 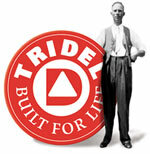 The Tridel Group of Companies shares not only executive leadership, but also the values of its founder, Jack DelZotto. In every sense of the word, the Tridel brand is truly a Canadian success story with 80,000 homes built. As Tridel has become the industry leader in condominium development, so too has Delmanor become an industry leader in Retirement Living. But even more important than our own success is the fact that we have helped thousands of families relocate and be able to call Toronto “home”. Something Jack Delzotto would be very proud of. Delmanor gains strength and experience from our affiliate companies and their expertise in construction technology, residential property management, real estate brokerage, and residential energy management.